Pac-Man Battle Royale Arcade Machine is the first four player competitive Pac-Man arcade game every made! The original Pac-Man game concept has been given a wild and carnivorous game twist with Pac-Man Battle Royale - Eliminate your opponents by eating them. The last player standing wins the round! When players eat a power pellet, they power-up by doubling in size and increasing in speed. Once powered up, they are now able to eat non powered-up blue players and ghosts. Players of the same size simply bounce off each other. Players can also be eliminated by running into ghosts if there aren't any powered up players. Eating a piece of fruit or all of the pellets resets the maze with a fresh new set of power pellets. At the end of the game, statistics are displayed for each player such as "Won Most Rounds" and "Ate Most Pac-Man" - This awesome new game is simple, competitive, and highly addictive. This game uses a small footprint suitable for locations of all sizes, from small arcade street locations and large family entertainment centers. Pac-Man Battle Royale Arcade Machine is the first four player competitive Pac-Man arcade game every made! The original Pac-Man game concept has been given a wild and carnivorous game twist with Pac-Man Battle Royale - Eliminate your opponents by eating them. The last player standing wins the round! At the end of the game, statistics are displayed for each player such as "Won Most Rounds" and "Ate Most Pac-Man" - This awesome new game is simple, competitive, and highly addictive. 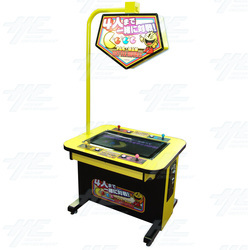 This game uses a small footprint suitable for locations of all sizes, from small arcade street locations and large family entertainment centers.